Okay, so everyone is going green(er) these days, right? I mean, going green is not new. We were kinda green in my family back in the 80s when my mom was big into recycling and could not stand to see someone throw an aluminum can in the trash. She rescued several poor cans during the 80s. Mom (she reads this blog, go figure!) used Bounce as her fabric softener in the dryer always, and so did I. 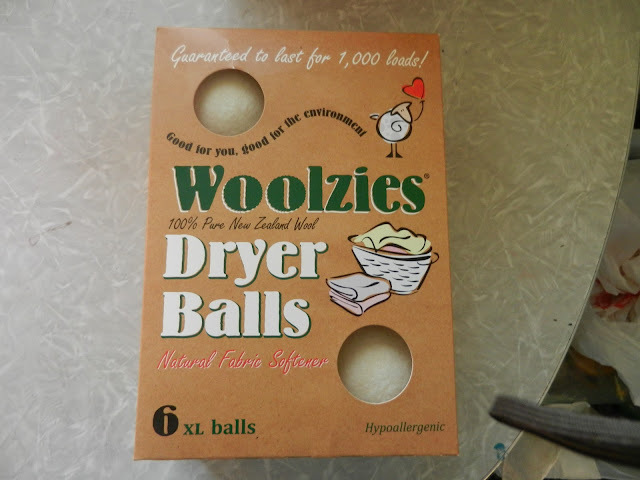 Then I learned about these wool dryer balls and wanted to give them a try. They work: our clothes were static-free and soft! The one negative for my household personally (and it probably won't affect you) is that there are SIX of them to keep track of. I had a hard time sorting them out from my clothes and leaving them in the dryer. Some would always come up in the laundry basket with me, then when I would try to get them to walk themselves back down to the basement, invariably a kid or a dog would get ahold of one of them and it was time to PLAY BALL!